One of the best accessories to have if you’re camping or hiking is a headlamp. A good flashlight is useful for sure, but when it comes to providing the brightest light, nothing can substitute a high lumen headlamp. The brightest headlamp is much more practical than your normal flashlight as you don’t need to hold it at all. In fact, you can just strap them onto your head, and you are good to go. Now, you can easily cook, read, and even use the washroom without constantly trying to juggle your light source. 2 How to Buy the Brightest Headlamp? To help you find the brightest headlamps, we reviewed many headlamps and have narrowed them down to eight final products that we absolutely love. Giving a maximum output of 5000 lumens, this is definitely one of the brightest headlamps out there. With three ultra-bright LEDs, Smiling Shark headlamp can surely turn your nighttime into the sunshine. It requires lithium-ion rechargeable batteries to function and can work up to 3-8 hours with fully charged batteries depending on the usage. However, you may have to give the batteries adequate time to charge which is around 6 to 8 hours. The light is fully adjustable to achieve maximum visibility. Although the headlamp is on the heavier side (around 7 ounces), its adjustable straps won’t really let you feel the weight. As for the tip, make sure that your batteries are fully charged before you head out as this lamp does consume a lot of power and you wouldn’t want to be left alone in the forest without any light. With a maximum output of 6000 lumens, the Snorda Zoomable Headlamp comes in our list with the highest lumen output. This headlamp is not only the brightest but also the most energy saving one. It comes with three LED bulbs with the center LED bulb adopting CREE XML-T6 LED light making it stronger and brighter for constant use. In addition to that, the headlamp also comes with a zoomable optical convex lens which features an adjustable angle from zero to ninety degrees. You can easily point your light in the direction you want and also focus by pushing or pulling on the rim of the center light. Furthermore, the lamp has an IPX5 waterproof rating which means that you can easily use the headlamp in different weather conditions. Its headband is also super stretchy and comfortable making it very easy to wear and carry around. With a running time of up to 100,000 hours and beam throw up to 800 meters, the Odear Headlamp has earned its place on our list. The headlamp has an adjustable angle (zero to ninety degrees) so that you can easily see around you. Alongside this, the headlamp has a stretchable headband which makes it more stable and comfortable to wear. The reason for this is that the headlamp is quite heavy. Furthermore, the headlamp comes with two different light modes and uses three Lithium-ion batteries. 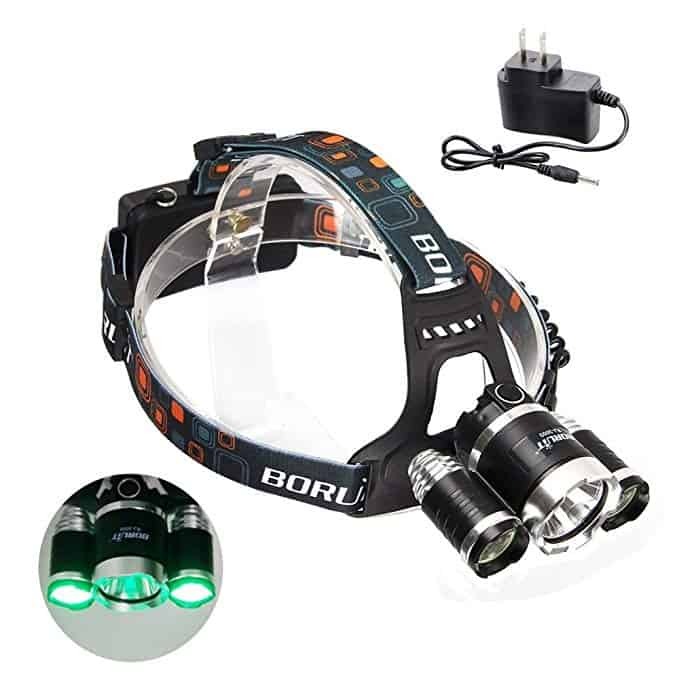 Also even with the highest mode on the headlamp can last for 6 to 8 hours when fully charged making this headlamp one of the best in terms of its battery life. Lastly, the headlamp is IP4 waterproof rated. This means that it is protected against splashing water from all angles. The Topwell shooting headlamp weighs around 10 ounces which is quite heavy. For that very reason, it has straps to go around your head and along the sides of the head too. 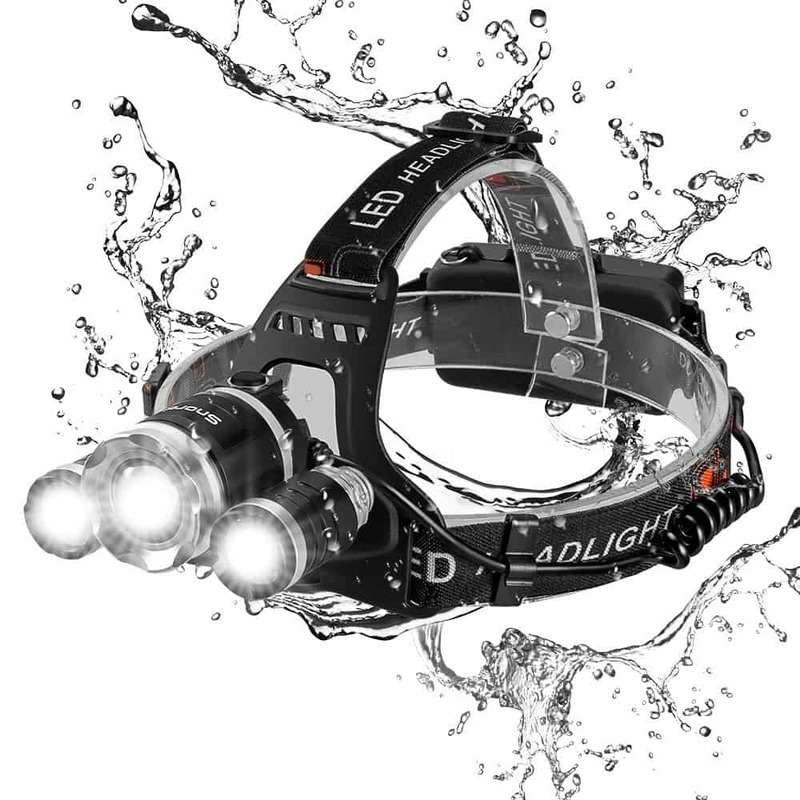 The straps make it easier to carry this powerful headlamp. Topwell Shooting headlamps have bigger bulbs and can illuminate up to 5000 lumens. It’s definitely one of the high lumen headlamps, and as a result, it comes with a rechargeable battery which is handy to carry as well. However, its total runtime is lower in comparison with the other headlights, mainly due to the high brightness it offers. This is why getting it properly charged is essential to get the best results from this lamp. For night light, Topwell shooting Headlight has two smaller green LEDs on the side. These nightlights don’t mess up with your night vision and save your battery. Being one of the latest releases from Coast, this headlamp offers the best Lumen to price ratio. Coast FL475 is powerful enough to give a maximum output of 430 lumens. Also, it comes with a weatherproof rating of IPX 4 and one-meter drop protection. It operates on AAA alkaline batteries and weighs just 3.2 ounces. One of the unique features of the Coast FL75 is its twist focusing optic. This feature allows the headlamp to go from an ultra-view full beam to a bull’s eye spot beam. Furthermore, the headlamp includes red and white LED – the red LED providing with excellent night vision. 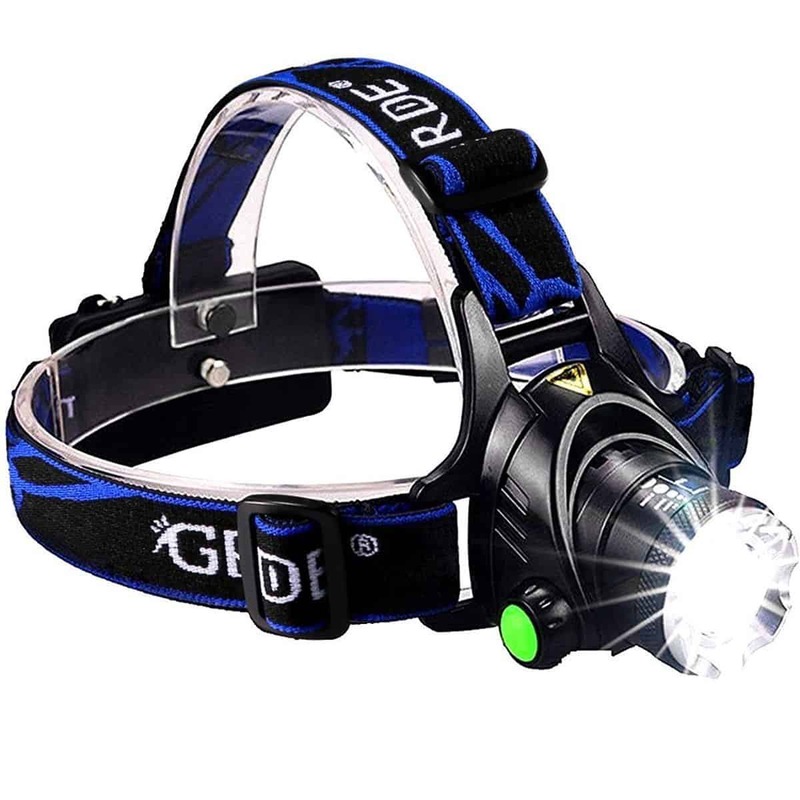 The GRDE Headlamp comes with three different light modes, is zoomable and gives a maximum output of 1800 lumens. 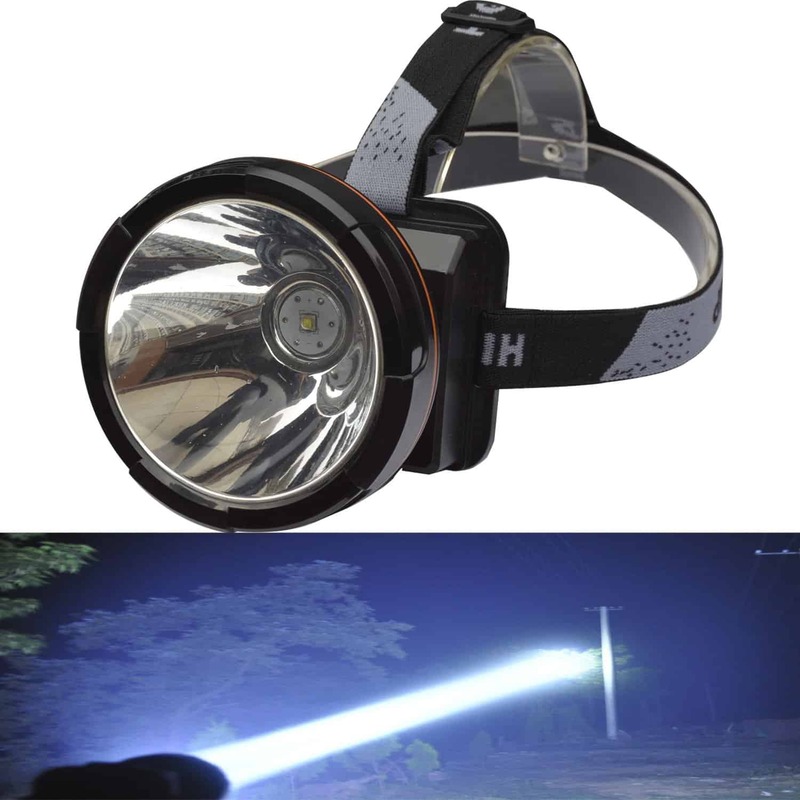 This headlamp in multi-functional as it can be used as a headlamp, waist lamp, and a desk lamp. So, even when you are not camping or hiking you can extract some use out of this headlamp. It uses two rechargeable 18650 batteries with a runtime of up to four hours in the highest mode. Additionally, the lamp is also waterproof so you can easily use it without necessarily worrying about the weather conditions. Lastly, the best part about the headlamp is that it has a single control button that switches between three light modes: high, low, and strobe. The single button saves you the hassle of fiddling with different buttons to get to the correct setting. 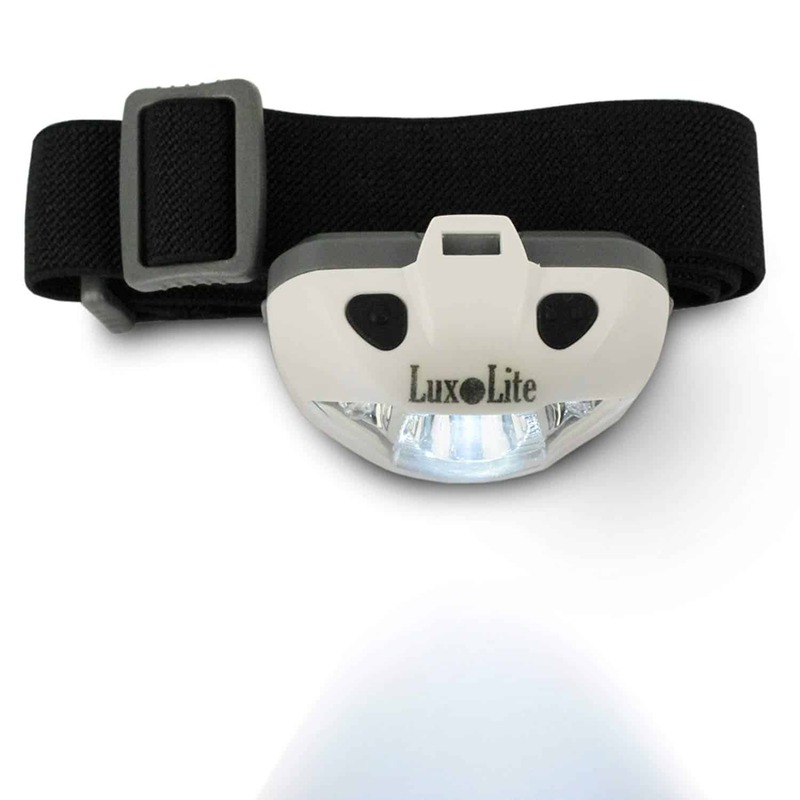 With a 1000 lumens output, this headlamp can be powered by one Lithium-ion battery or two 123A batteries. The Fenix HP25R is a high lumen headlamp with multiple smart features. The features include a battery level indicator, three lighting modes, and a dedicated push button for the spot and floodlights. Consequently, you wouldn’t have to scrabble around the headlamp’s every setting. One of the most noteworthy features of this lamp has to be the aluminum chassis. The chassis helps keep the lamp cool during outdoor activities by shedding heat away from your head. It weighs 6.5 ounces without battery. The headlamp has a maximum runtime of 150 hours making it one of the most favorable picks for longer trips. 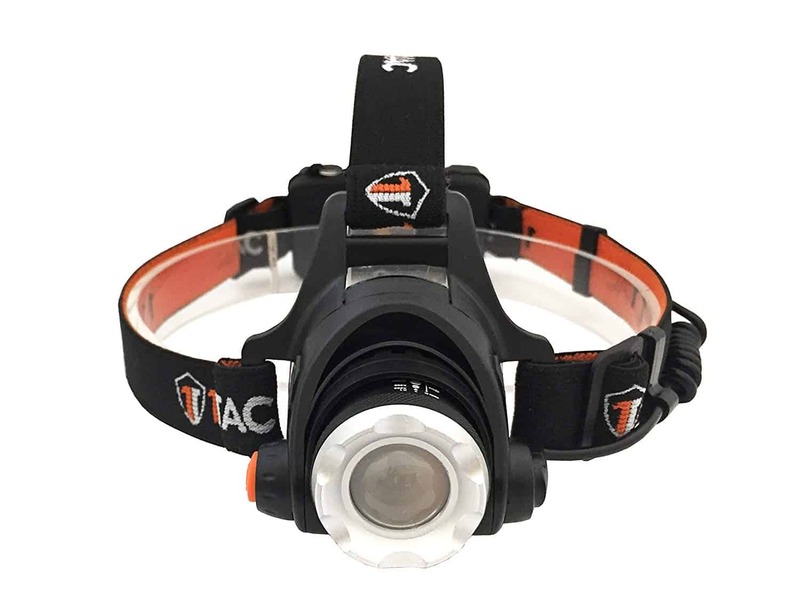 The 1TAC HL 1200 Tactical Headlamp is very popular and has been rated as number 1 in terms of its durability and compactness. The headlamp has plenty of features such as an adjustable zoom, rechargeable batteries, three light modes, and it’s also fully waterproof. In addition to that, this headlamp has a pretty strong build. It is made from aircraft grade aluminum which makes it completely scratch and damage resistant. Furthermore, the lamp comes with 18650 batteries. You need two of these for the headlamp to work properly. The best feature I found about this lamp is that it has a zoom feature as you can easily zoom in or out by pulling out or pushing in the lens. This makes it super easy and convenient to use! The Black Diamond Spot 325 Headlamp is a perfect balance of durability, weight, power, and price. The headlamp can illuminate up to 324 lumens and has a touch-sensitive slide for making quick brightness adjustments. 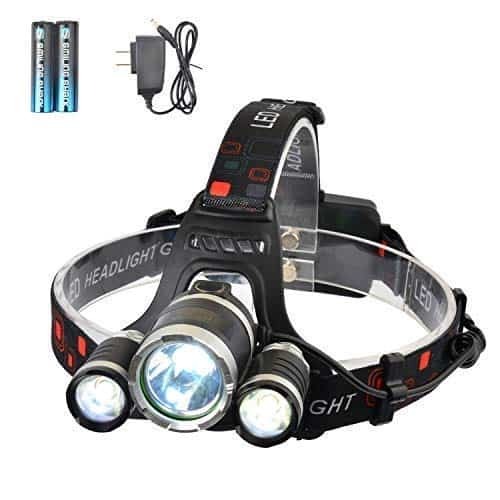 Additionally, this headlamp also provides you with a multitude of lighting options, from a long-range LED to a much softer LED to be used in proximity. It also features a red LED that can be used around camps. Weighing around three ounces, Black Diamond Spot Headlamp isn’t just convenient to hold, but it can also withstand being under 1.1 meters of water for 30 minutes. Due to this, you can use it freely outdoors without fearing a downpour that could potentially hinder your adventure. Moreover, it uses three AAA batteries and has a power meter showing the remaining battery life. Weighing about three ounces, the Luxolite Waterproof LED Head Flashlight is extremely lightweight and super easy to carry. It also comes with stretchy, comfortable, and adjustable head straps that can fit on any person. The headlamp can illuminate up to 170 lumens. This might not be the most powerful headlamp on our list, but its adjustable brightness levels will surely take care of your requirements. One of the most noteworthy features of this lamp is its waterproof built (IPX 6 rated headlamp). Alongside that, there’s also an option to change the direction of the beam. You can either have the headlamp shining upright or angle it down towards the ground. The Luxolite LED flashlight contains a triple LED with four different modes containing an SOS feature. Besides that, it also has two night-vision modes and a strobe feature. How to Buy the Brightest Headlamp? Now that you know our top picks for the Headlamps, here are some additional tips to make your experience easier while choosing the best one. To begin with, your headlamp should be bright enough to illuminate your way. But again, you don’t want to practically be walking with a massive ball of light above your head so make sure you choose the headlamp that can give you the right amount of light and the most appropriate beam length. For this purpose, keep in mind to check the lumens – the higher the lumens, the higher will be the level of brightness. Additionally, you also need to have a good look at the weight and size of the headlamp. Make sure you’re getting one that you can carry. There are tons of extremely lightweight headlamps available in the market so do explore them. Another thing that comes with weight is the size of these headlamps. Also, the majority of the headlamps come with adjustable straps so be mindful that the headlamp you’re buying can fit you appropriately. In addition, the most powerful headlamp also often is larger in size and weighs more than other headlamps. So keep this in mind when looking for the high lumen headlamp. Furthermore, another thing that really requires your attention is battery life as well as battery type. You must have seen even in our picks that the battery life for most of the headlamps greatly varied according to their specs. It’s better if you go for a headlamp that has a battery life of at least 10 hours at normal usage. 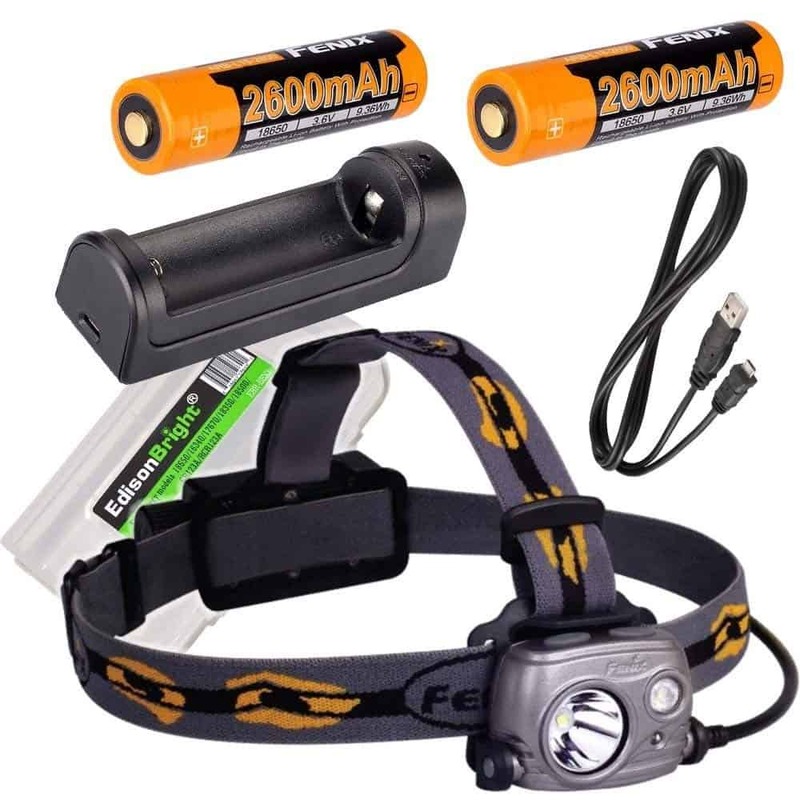 The brightest headlamp also needs more powerful batteries, one of the reasons why it weighs more. Moving on, you must have also noticed that some headlamps had replaceable batteries while others were rechargeable through a power bank, USB port, or solar charger. I personally prefer the rechargeable ones, but you can go for replaceable batteries if you don’t mind having an ample supply of batteries while traveling. Just keep in mind, high lumen headlamp can drain battery really fast. So make sure your battery is fully charged when going out in the case of rechargeable batteries. Weather resistance is another thing you should be careful of if you intend to use headlamp outdoors. It’ll be preferable to invest in such a headlamp that is at least weather resistant if not fully waterproof. The IPX scale is a measure of water resistance so make sure to check the IPX rating before buying. Weight: is it lightweight in case you want to use it for running or trekking? High beam distance: another good feature for those who want to use the headlamp for running or trail biking. Spot beam: in case you want to use it for trail biking. Water-resistant: when you want to use it for camping. hiking, or on adventure travels. Long Lasting rechargeable batteries: must-have for camping and traveling. Red light: another must have feature for those who want to use it for camping. Tilt feature: for those who want headlamp for climbing. Lock-out: for headlamps you want to use when hiking. Light sensors: another must-have feature for hikers. To wrap it up, headlamps are an essential accessory for hikers, climbers, campers, cyclists, mountaineers, and other individuals with outdoor interests. Usually, It is difficult to pick up the best one when there are literally tons of similar products out there. To counter this, we have mentioned the best brightest headlamps with all the necessary details in this article. You can find the most powerful headlamp as well as the brightest headlamp on our list. We are sure you can find the one you are looking for.